Today’s Cute Outfit Ideas of the Week is dedicated to Moto Boots. They are a hot item for fall and the perfect transition shoe for the season. 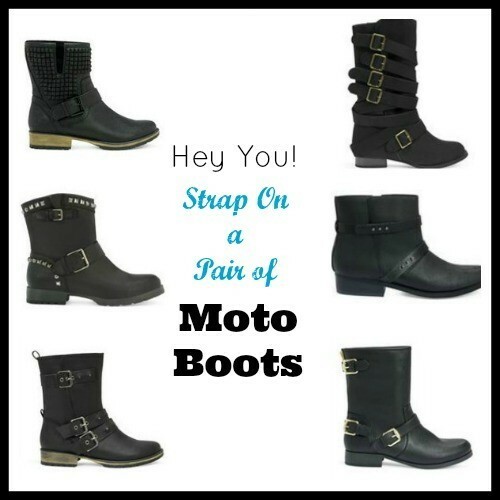 Now, you might think ‘I can’t wear a moto boot.’ To which I say ‘Oh yes you can girl!’. Let me show you how with some cute outfit ideas I created. No helmet or motorcycle required. Promise. But first, here are some super fab moto boots from none other than…JustFab.com (where I recently purchased my riding boots). Which cute outfit idea featuring the moto boot did you like best? Would you try any of them?